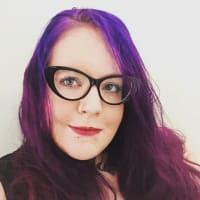 I am relatively new in the world of programming, and I have decided to document new concepts and other things that took me a while to figure out - not only to solidify my learning but to help others who may be trying to learn or accomplish the same things. I set up Windows Subsystem for Linux (WSL) using a conglomerate of different blogs and resources, with varying levels of being out of date. I did not come across one that was recent and had all I needed in it, so hopefully this can serve that purpose for someone. 1) Make sure you are running Windows 10. 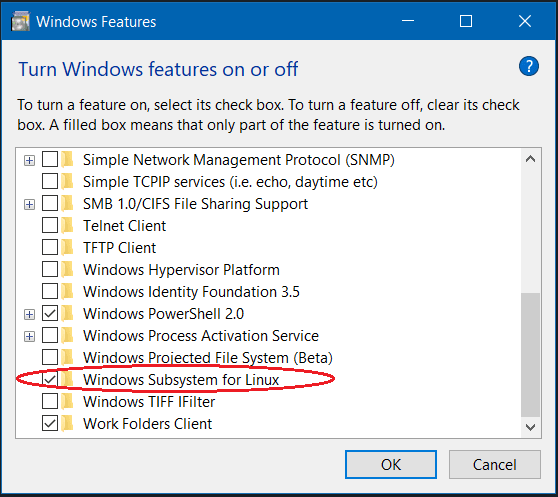 Windows Subsystem Linux (WSL) is not automatically enabled on windows. So, to start off, we need to enable it! 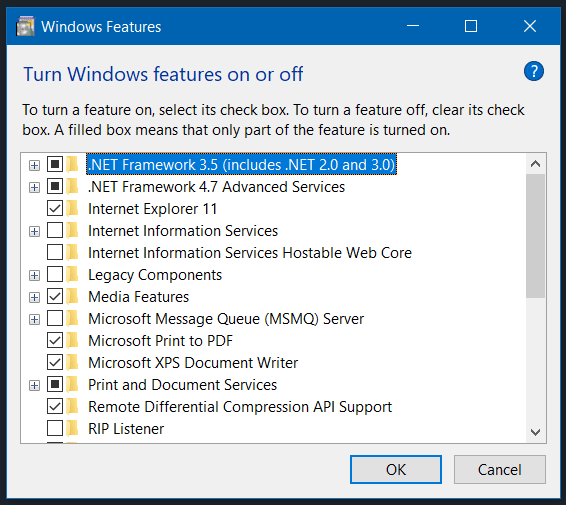 c) Scroll down until you see "Windows Subsystem for Linux" - ensure its box is checked! 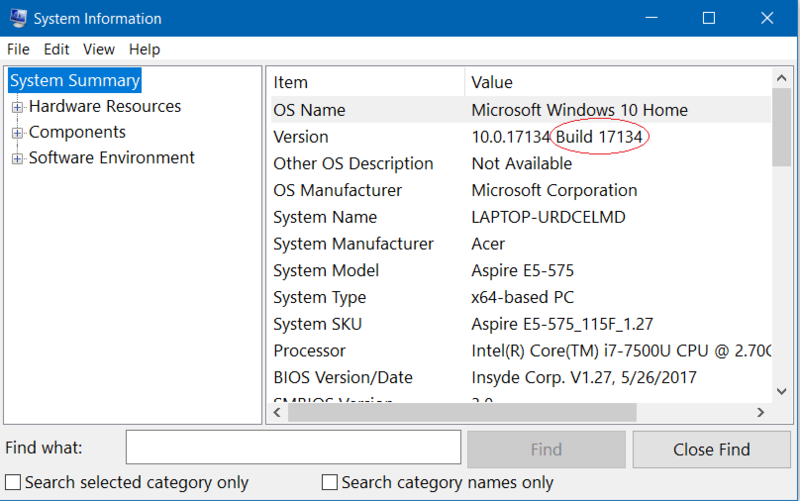 3) Check your Windows 10 version by going to System Information and checking your Version. If your build is earlier than 16215, skip step 4 and proceed to step 5. 4) Open up Microsoft Store. Search for "Ubuntu"
6) Open up the Ubuntu app. Follow the prompts, which will include making a username and password. Don't forget your password! Note: if you get an error at this step that says Windows Subsystem for Linux has no installed distributions. 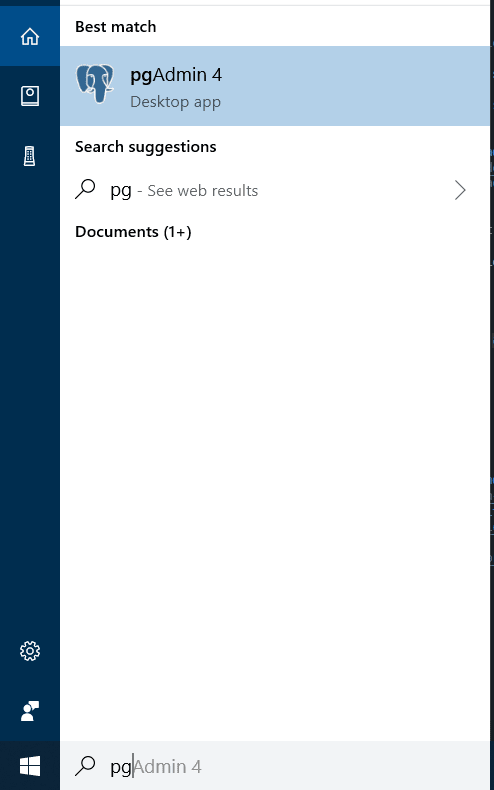 Distributions can be installed by visiting the Windows Store: https://aka.ms/wslstore Press any key to continue..., try manually starting or restarting LxssManager in your Services Desktop App (just search services in your windows search bar). In the L section, you can right-click LxssManager and choose Restart or Start. You can either communicate with your remote repositories via HTTPS or SSH. If you want to use SSH (which means you will not have to authenticate with your GitHub username and password before each push) - follow these instructions. 5) Now let's get NodeJS installed, and then Rails so we can make a bunch of stuff! You can use any editor you want, but I am going to be walking through setting up VSCode. 1) Download VSCode here. Choose the Windows download, not the Linux download. Any required Linux downloads will be done via the Ubuntu terminal, and everything else should be downloaded for your Windows OS. begin typing the following: Terminal: Select Default Shell until you see it. Select that option. 3) Now, you can use your Ubuntu terminal in VSCode. Select "New Terminal" in the "Terminal" drop-down, or type Ctrl+Shift+` in order to use it! You can add a few things to your User Settings to customize and improve your programming experience. Most importantly, we can make VSCode treat .erb files like .html files, allowing us to use all the same shortcuts and get the same syntax highlighting. Note that for the Hack font to be usable, you have to download it. You can check it out here. Your terminal is actually accessing an Ubuntu Virtual Machine which is running inside of your Windows OS. If you ever cd in your terminal, you will be sent to the 'user home' of your Linux VM. That is also the default location you will be in when you open your Ubuntu app. You actually want to do all of your business inside of your normal Windows file space, not your Linux VM file space. 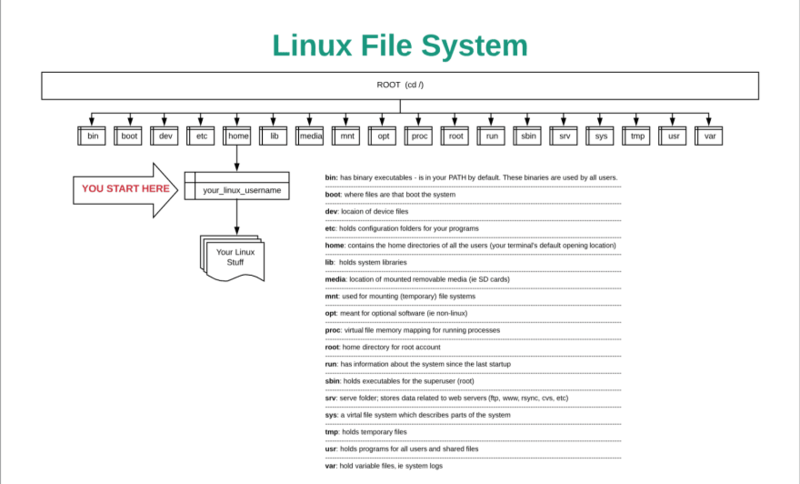 So, you will need to know how to navigate in your terminal from your Ubuntu file system to your Windows file system. This is pretty simple if you understand how the system is set up, so let's go over that quickly. 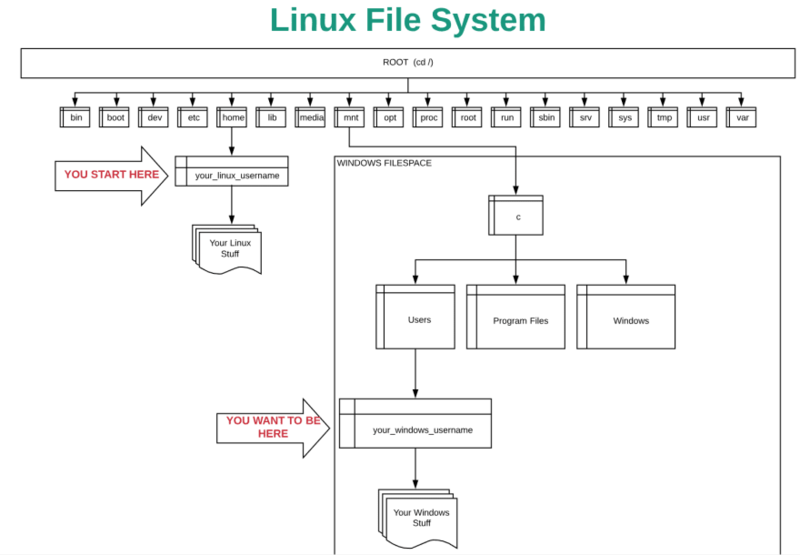 To allow you to access the functionality of a Linux machine, Windows stores the Ubuntu OS and file system inside of its own file system. You should NEVER access your Ubuntu files via your Windows machine. What you SHOULD do is save everything you are working on in your normal Windows file space, and access that via your Ubuntu terminal. So, how do you do that? 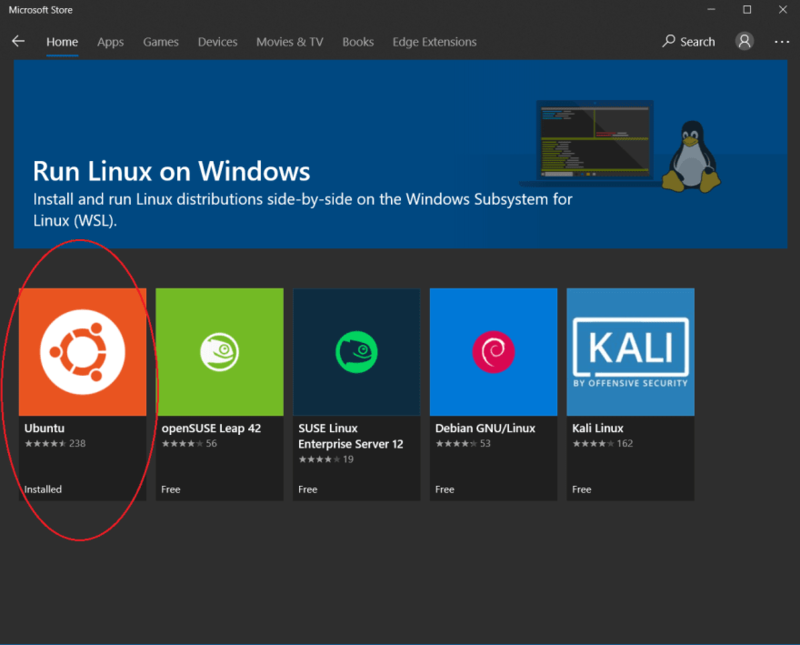 Well, from the Ubuntu's point of view, it is just a normal Linux machine, but Microsoft has made a pathway between the Linux VM and your Windows OS via the /mnt directory in your Ubuntu's root. You save a file you have modified in nano by following the directions at the bottom of the screen: click Ctrl+X and then y and then Enter to save your changes. If you feel uncomfortable with these commands, check out the basic Linux commands link below in the resources. (if you are in your Linux file system, VSCode will open, but not to the right spot). Setting up PostgreSQL allows simple production-level database integration into a Rails project. 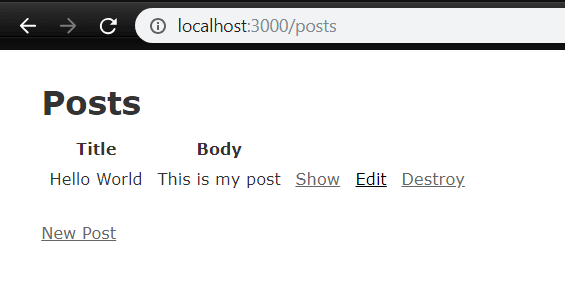 This allows easy hosting on Heroku with only a little setup. 1) First, we want to Download PostgreSQL for Windows - download the Interactive Installer. 3) There are a few ways to do the next few steps but the easiest way is to use pgAdmin. 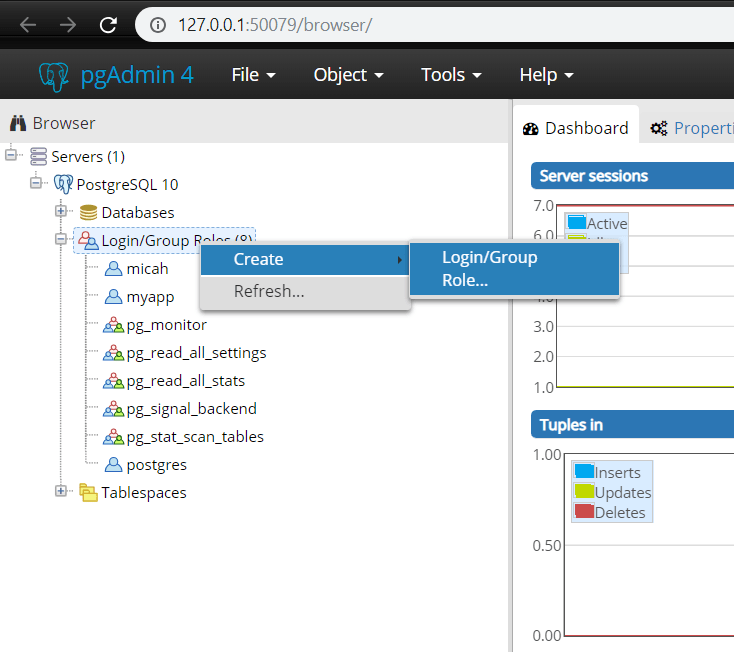 Open up pgAdmin, which is a Graphical User Interface for PostgreSQL. This should open up pgAdmin in your browser. 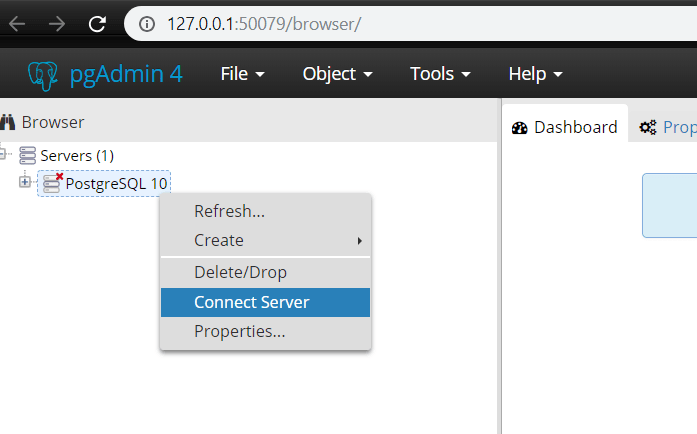 Start a server by right-clicking "PostgreSQL" and selecting "Connect Server"
Your PostgreSQL server is running, and can now be integrated into your projects. You also want to set up a new user/role and password that you want to use with your rails app. Ensure you give your user/role all available permissions during setup. During setup, ensure to fill out Name in the General tab, Password in the Definition tab, and enable all permissions in the Privileges tab. Make sure your server is connected and roles are configured as described above. Now, let's configure our database.yml file to allow our app to connect to our database. Add the following to your config/database.yml file under BOTH development: and test: You will need to add a user and password which will correspond to the roles we created in pgAdmin. 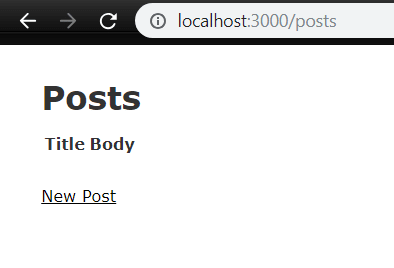 If you navigate to localhost:3000 you should see that we are on Rails! Now just follow the crud links and try to make a post! 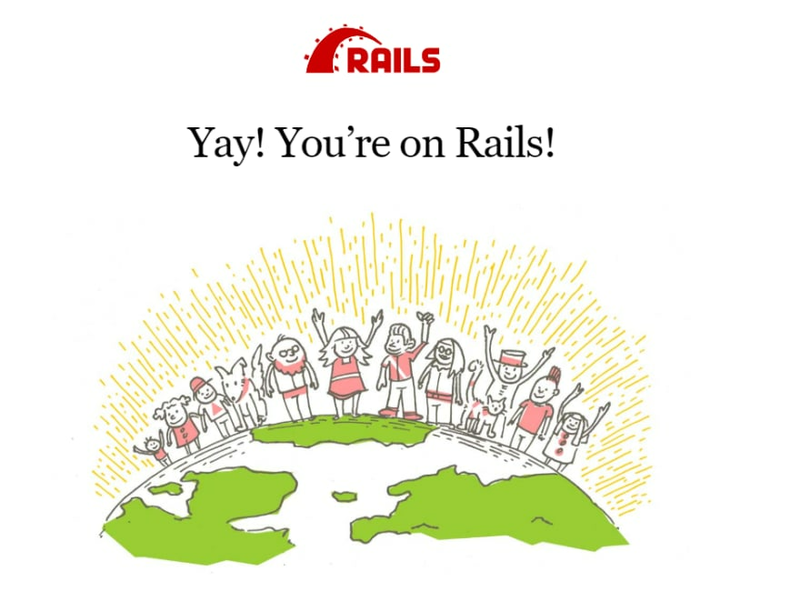 We should be seeing our database working great with our rails app! Hopefully, everything is working for you! Now you're ready to develop using WSL! Naval Academy Graduate (Systems Engineering), former Submarine Officer. 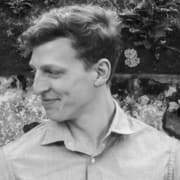 Currently getting my MS in Computer & Electrical Eng, and recently graduated Flatiron's Software Engineering bootcamp. For being "relatively new to the world of programming", you've compiled a nice overview on how to get started! How is WSL with inotify events these days? I last tried it (like you, piecing it together from a half-dozen inaccurate blogs) about a year ago and was unimpressed. It's great in principal to be able to run Node and a modern front end stack on the virtual machine, and edit files from windows in VSC. But if saving a file in VSC doesn't notify the Node tasks on WSL that anything has happened, that's basically 90% of the fluidity of any node-based workflow down the toilet. So I only set this up myself a week or so ago, and my experience making apps is minimal - I am still very much learning more than doing. However, I was able to find this blog post by Microsoft confirming inotify support at the end of 2016, and the only github issues open that I could find were around the same timeframe and are now closed. From this evidence, I would guess it works well, but I'll be sure to keep this post up to date with any big issues I encounter. While this is a neat toy (and I seriously recommend anyone who's into that to install a Windows X server, like Xming or VcXsrv, to be able to run X11 applications on Windows), it may be worth noting that RVM / Ruby, git, NodeJS, Rails, PostgreSQL etc. all have a native Windows version which will hog notably less RAM and CPU time, so you probably won't have an advantage from using the WSL for most development things. That's interesting to hear! Like I said in my post, I'm pretty new in the programming world, so I'm definitely not an expert on the subject. The reason I set up WSL as opposed to downloading native Windows versions is because of the article in this Microsoft doc, which said that there are sometimes Windows-specific issues with gems and dependencies when using ruby or nodejs. I haven't found any yet, but my number of Ruby applications (which I use, at least) is rather small. Thanks! I downloaded the Windows VSCode, so I didn't run into that problem. It works great, and code . works too if you are in your Windows file system! Thank you for making it that easy I've been all over the internet to get all these info. everything is working fine on my laptop now. I'm new to programming "Flatiron School" too, starting soon. the school is asking for a Mac for the Bootcamp but I don't like/can't afford a Mac now. I have a high end Surface Book i7 16 512 dGPU which is amazing! how is your experience going through the bootcamp using windows? not sure if I should sell my surface and buy a Macbook pro? Hey man, I have a Mac and a Windows, both are working fine for me. I'm in the Rails section and haven't had any problems with my Windows using WSL. While testing this procedure I also started a React project and there were no obvious problems. There is a Flatiron beta cohort right now with a few students testing my setup to make sure it works through the whole curriculum, and if they don't hit any snags Flatiron is supposedly going to make using WSL an official supported environment. So, long story short I would say that while not "officially supported" by Flatiron, if you like your laptop and have WSL running on it with no problems, you should be fine and I don't see any reason you should sell it for a Mac. I was just googling any good deals on Macs, now I can have some peace! i did factory reset yesterday to have a clean windows and WSL, went through the steps here and everything looks great. I'm starting tomorrow (will go with my surface) and I'll check with the instructors. will update in a reply here. I landed on your page trying to use VScode with WSL and git using ssh. I use git with the ssh-agent on WSL with no issues but am not able to use that along with VScode. Hoped to find something about that - but shall keep googling! Great article BTW. Easily create clean, single purpose commits by utilizing git's interactive command line menu for staging code changes.